Whether it’s through mortgages, student loans, or credit card debt, nearly everyone (especially real estate investors!) is in the note business. The trouble is, most people are on the other side of it: writing checks to note holders rather than cashing checks as note owners. Make big profits investing in notes, even if you have no experience. 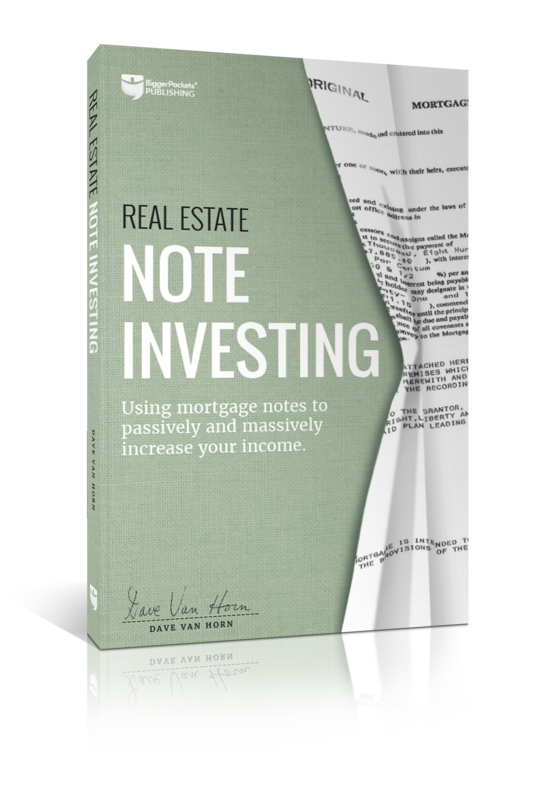 Use notes to raise more money for your physical real estate deals. Make strong returns without the pain of dealing with tenants. Recognize the different types of notes—and learn which ones to stay away from. Scale your business through a passive investment vehicle backed by hard real estate. Use note investing to pay for expenses or simply to provide additional cash flow. Are you a wholesaler, a rehabber, a landlord, or even a turnkey investor? This book will help you turn your focus to the “other side” of real estate investing, allowing you to make money without tenants, toilets, and termites. Starting at $19.99, this book is ONLY available on BiggerPockets.com. Order here. Exciting! Will it be available on any extern platforms like audible, google books etc any time soon? I had the same issue and customer service said that there is no PDF version. The only versions available are the Amazon Kindle version and the book application for MAC/iPhone. It should be ePub for mac platform. They do make an eReader that does both mobi (Kindle) and ePub (everything else). I love note investing! Buying it now. I’m sure I’ll learn something new! Thanks @Dave Van Horn! How do I add this to my Kindle library? This book looks to be a very good value at $20. I also agree with other posters, I'd be interested in an audible version since I listen to many books with my audible.com subscription. Hey Art, check out an app called Voice Dream. It can read PDFs aloud to you. I use it all of the time when audible versions of books aren't available. Really looking forward to this one. It’s a little out of the norm from the traditional types of investments. Thinking a little unlike everyone else is where the real moves are made. I’m sure I will pick up some great pointers. The link is not working. There are other people who have also purchased this and have had the same issue. How and when will this be resolved? @Jeanne Hink on it! Should be fixed soon, if not already. Thanks! FYI: If anyone has any questions at all after reading, feel free to reach out! Always happy to help new investors get started in the note business! Great to see a book on this, I feel there is not enough on this topic. Just finished the book it is an easy read and very informative. I hope to put the information to use and begin profiting from this area of investing. I did notice that in my version of the epub, some the illustration (latter int he book) are not there. How does buying the audio work? What format is it in, anyone know? Also, had anyone actually done this? Note investing seems a lot more difficult and risky than just buy rentals. @Roger Jones it's mp3 format. I only have the audio version and it's a good book. It took me a little while to get used to audio books, but now they're indispensable to me. I'll still get the ebook for the text to refer to because it's just my thing to collect the ebook versions and I still like to read to learn and helps me retain it more. @Dave Van Horn I finally got around to ordering my copy last night. Thanks for all of your generous support, solid content, willingness to serve and come out to speak at NYC BP Meet Up and for all of your thoughtful responses to me and so many others on BP and beyond!!! Thank You @Brandon Z. ! It's my pleasure. I was just saying to someone that it's responses like these that keep me going! Hope you enjoy the book! This is just the book I’ve been looking for! Perfect timing as I’ve been interested in learning about this note investing. Thanks so much Dave Van Horn! I can’t wait to devour the book! Thanks @Manuel Rodriguez ! Hope you like it! @Dave Van Horn my mind was blown....thank you!! The principles of thinking like the bank have reshapped my understanding of financing and leverage. Thank you for your candor and your vulnerability...great read, highly recommend!! !